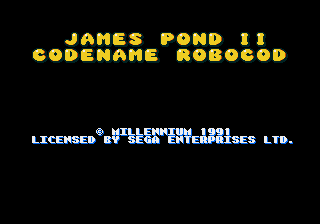 James Pond II: Codename RoboCod (ジェームスポンドII コードネーム・ロボコッド) (also known as Super James Pond or Super James Pond II) is a platforming sequel to James Pond. It was released on a variety of platforms, including the Sega Mega Drive in 1991 (and the only Mega Drive entry in the series released in Japan) and the Sega Game Gear and Sega Master System in 1993. The game has numerous parodies to the film RoboCop, including a similar theme song. James Pond II was re-released in Europe as part of the EA Classics range, however curiously shipped with a redesigned cartridge label giving the game a North American ESRB rating (of Kids-to-Adults). This redesigned cartridge is not thought to have been officially released in North America, however. Gameplay differs heavily from the original. This game is a conventional platformer, with James Pond moving on land and jumping without the aid or need for water. There are no missions; instead, Pond must find an exit sign in each level (accessible through doors into a building in the overworld). jumps. Holding or causes Pond to stretch his body up until he is blocked by some overhead item; letting go lowers his body back to normal. crouches. Main article: James Pond II: Codename RoboCod/Magazine articles.